Are boat turnbacks unlawful under Australian workplace law? Australia's boat turnback legislation is based on a legally invalid declaration, making boat turnbacks unlawful under workplace law, writes employment law expert Max Costello. HOW DOES AUSTRALIA'S workplace law make boat turnbacks unlawful? (b) any waters and any installation on land, on the bed of any waters or floating on any waters. 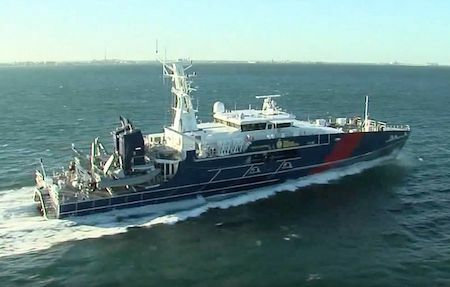 It means that, if Commonwealth workers – defence and Australian Border Force personnel, for example – do "on-water" work, such as turning back asylum seeker boats as part of Operation Sovereign Borders (OSB), they do so at a Commonwealth "workplace". Those “other persons” during OSB operations are the people – on boats heading towards Australia – who are typically seeking refuge from persecution, including, for example, being shot at or tortured. To see how Section 28(b) works, imagine you’re a Commonwealth worker, a navy captain and you’re carrying out an OSB activity. If a particular boat looks grossly overloaded and your subordinates find that it’s taking on a lot of water, Section 28(b) says you can’t just turn it back to where it came from, because it might sink and its passengers might drown. (a) In the case of an offence committed by an individual … — $50 000. Now, do you see what I mean by criminal offences? Okay, boat turnbacks might involve a criminal offence under workplace laws, I hear you acknowledge. But the boats haven’t been getting here for nearly five years now – which means lots must have been turned back – so, how come no Navy captain’s ever been prosecuted for breaching Section 28(b)? I, General David Hurley AC DSC, Chief of the Defence Force, make the following declaration under the Work Health and Safety Act 2011. (b) as part of moving the vessel to a place outside Australia. (c) while moving the person to or from a vessel in the course of paragraph (a) or (b). (4) However, the transfer or movement of a person suspected of being an illegal maritime arrival to an offshore regional processing centre is not part of an activity described in subsection (2) or (3). Is the declaration legally valid? In other words, did the WHS Act clearly authorise that declaration? The opening words of Section 5(1) identify the WHS Act’s Section 12D(2) as the authorising provision, so let’s look at it, in context. (1) Nothing in this Act requires or permits a person to take any action, or to refrain from taking any action, that would be, or could reasonably be expected to be, prejudicial to Australia’s defence. (3) A declaration under subsection (2) may only be made with the approval of the Minister and, if made with that approval, has effect according to its terms. Section 12D’s heading, plus 12D(1)’s wording, make the section’s purpose clear. It is to ensure that nothing OSB workers do or don’t do under the WHS Act 'would be, or could reasonably be expected to be, prejudicial to Australia’s defence'. So, if something potentially 'prejudicial to Australia’s defence' could arise from WHS Act-related acts or omissions during OSB, Section 12D(2) authorises the defence chief to issue a clarifying declaration. Let’s be clear what such a declaration really says to OSB workers. It says, in effect, that, although Section 28(b) makes it a criminal offence for you to turn back a boat if that would 'adversely affect the health and safety of [the] other persons [on board]', you don’t legally have to be concerned about their health or safety, because the declaration says 28(b) doesn’t apply to OSB 'activity'. On the other hand, if there would not be and could never 'reasonably be expected to be' anything prejudicial to Australia’s defence arising from WHS Act-related acts or omissions, such as boat turnbacks or non-turnbacks, then there’s no need for a declaration. Indeed, there is no basis, no authority, to make such a declaration. Surely, that is the situation here. The unarmed boats and people targeted by OSB are not an invading navy, so whatever OSB workers do, or don’t do, to them, cannot 'reasonably be expected to be, prejudicial to Australia’s defence'. You may say: that’s just your opinion: where’s your evidence? Chief of the Defence Force General Angus Campbell greets the new Prime Minister, Scott Morrison. The evidence should be in the declaration’s explanatory statement. (By law, a declaration, being a 'legislative instrument', must be accompanied by an explanatory statement). What the declaration’s statement should explain is whether any OSB workers’ 28(b)-related acts or omissions would – or would not – be prejudicial to Australia’s defence. But the statement – while it says complying with 28(b) might 'not always be possible' in 'a hazardous, uncertain and high-tempo operational environment, … potentially [involving] uncooperative persons' – says nothing at all about prejudice to the area of defence. What that total silence tacitly admits is that, if OSB workers do not turn back a boat, they do not cause prejudice to Australia’s defence. And, since there is no prejudice to the area of defence, then, as a matter of logic, there’s no need and no legal basis, for the declaration. Lastly, Section 12D(3) says the defence chief can only make a declaration if 'the Minister' – the minister for employment (because the WHS Act is a workplace law) – approves it. In December 2013, that minister was Tasmanian Senator Eric Abetz. As a former solicitor, he would’ve known that the declaration was legally invalid. But he approved it anyway. Why? Because the non-turnback of boats by law-abiding OSB workers could have been prejudicial, not to Australia’s defence, but to the newly elected Abbott Government’s “Stop the boats” policy. So, what the defence chief issued (presumably without being fully apprised) was not a legal declaration — it was a political one. Max Costello LLM is a retired WorkSafe Victoria prosecutions solicitor and lecturer in Employment Law at Melbourne’s RMIT University. He has co-written submissions to Senate committees concerning asylum seeker health and safety and is the author of 'Offshore Crimes'. BREAKING: Fishing vessel with 17 au pairs aboard arrives in far north Queensland. Border Force officers currently rolling out red carpet and sprinkling rose petals on beach.